Make your doll a hippie for Halloween – congrats to our latest design winner! UK designer Sharon Turner of Scrummy Things is our winner this week with her 'honey hippy dolly love dress', an easy to make dress pattern that fits an 18" doll (& various other sizes as well if you're a determined 5-year old). The entries this week were terrific and would make very nice, affordable gifts for those whose floors are, like ours, often strewn with potential models for this sort of thing. [Read more…] about Make your doll a hippie for Halloween – congrats to our latest design winner! This week's theme is niche even by our standards. We asked designers to create cut & sew patterns for 18-inch dolls (like the American Girl doll series). What was appealing about this as a challenge is that a pattern for doll's clothing can easily fit onto a fat quarter of fabric as a kit, and would make a lovely gift for your doll-loving friends or family. Rosanna Bernstein of Miami Beach rounded up the most votes in the finals of our doll panels contest. She's a grandmother and this is the first time she's ever entered her work into a contest, so she tells us it's especially exciting for her to see Jazzy win. 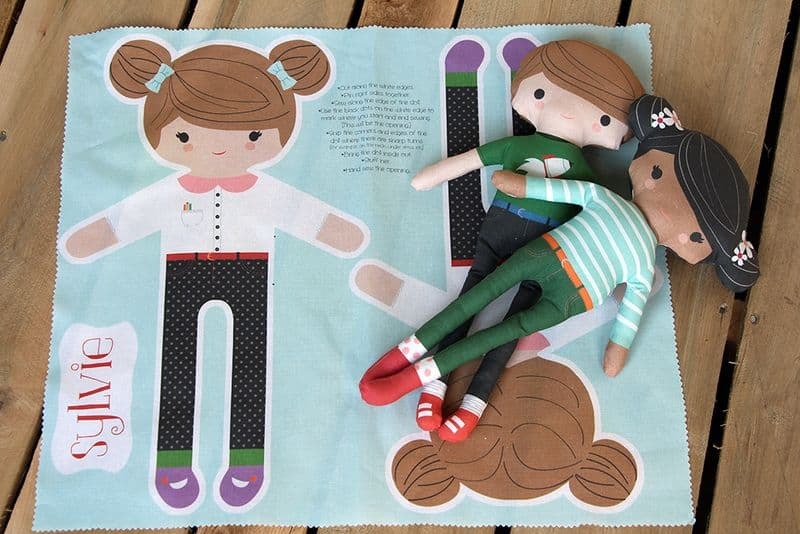 You can find more of Rosanna's work in her Etsy shop, and you can buy your own Jazzy doll kit here. Thanks to all the designers who participated and to all of you who voted! You can check out the schedule of our upcoming themed contests here. Once again we were blown away by all the responses to this week’s contest theme. With 77 entries in the Doll Panel contest, once again we’ll be breaking the contest into two weeks of semifinal voting with a third week for the finals. to ‘doll panels’ it most favors.